November 9, 2018 By Allyson 11 Comments This post may contain affiliate links. Read my disclosure policy. 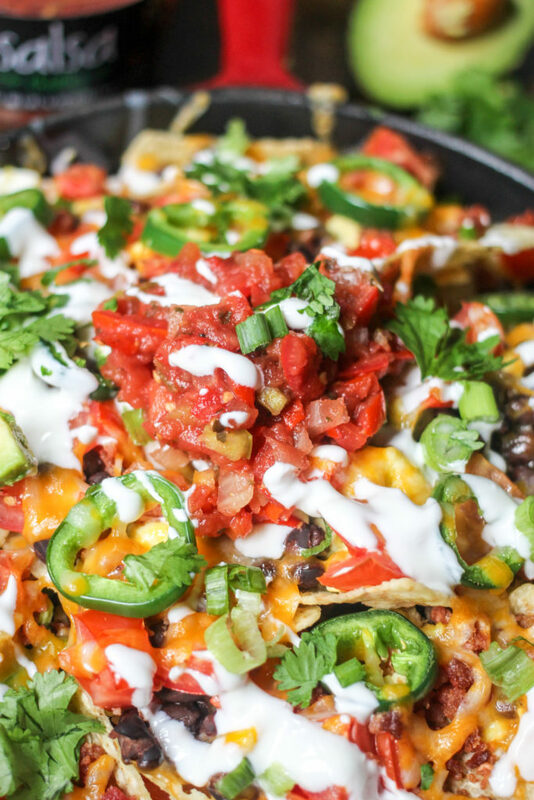 Loaded Breakfast Nachos are the perfect solution for tailgating, game day, or a quick meal. Crunchy tortilla chips are layered with eggs, bacon, and classic nacho toppings for an amazing appetizer! 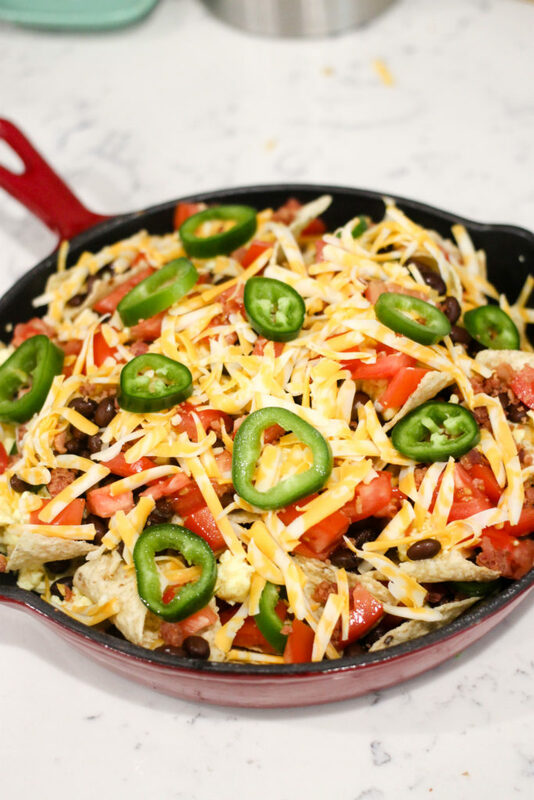 Loaded Breakfast Nachos are the answer to all early socializing events! Whip these bad boys up for a late morning game-day brunch, tailgating at 10am, or just when you feel like a hearty meal. I’ve loaded these nachos up with eggs, bacon, black beans, tomatoes, jalapeños, and cheese, and then topped them with creamy avocado, sour cream, salsa, and cilantro. These are the ULTIMATE nachos! Today’s post is sponsored by Fresh Cravings Salsa, but all opinions are my own. My husband is a HUGE college football fan, Go Dawgs (UGA), and we are often up early watching Game-Day with friends and family. I always want to start eating “football” food right away, but sometimes it seems too early. This is where LOADED BREAKFAST NACHOS come in. If you’ve never tried eggs and bacon on nachos, you are seriously missing out. It is SO GOOD. Making breakfast nachos is so easy, and everyone will be calling you a genius when you serve these. It’s one of those meals you see and think, “why didn’t I think of that?! ?” No worries, you still have time to WOW everyone! Get all the ingredients together, including Fresh Cravings Salsa, and preheat the oven to 350 degrees F.
This also means you should have the eggs scrambled and ready to go, or you need to make them now. Same goes for the bacon – or use pre-cooked bacon. I like using triangle or round shaped tortilla chips for nachos, but feel free to use whatever type you prefer. Spread the chips out on a baking sheet or in a skillet (my favorite way to serve/make nachos). Start layering the toppings. Add some more chips, keep layering. Once the chips are loaded up, pop the baking sheet or skillet into the oven. Cook for about 10 minutes, watching to make sure they aren’t burning. Remove from oven. Top with avocado, sour cream, Fresh Cravings Salsa, and cilantro. Serve the breakfast nachos and DIG IN! 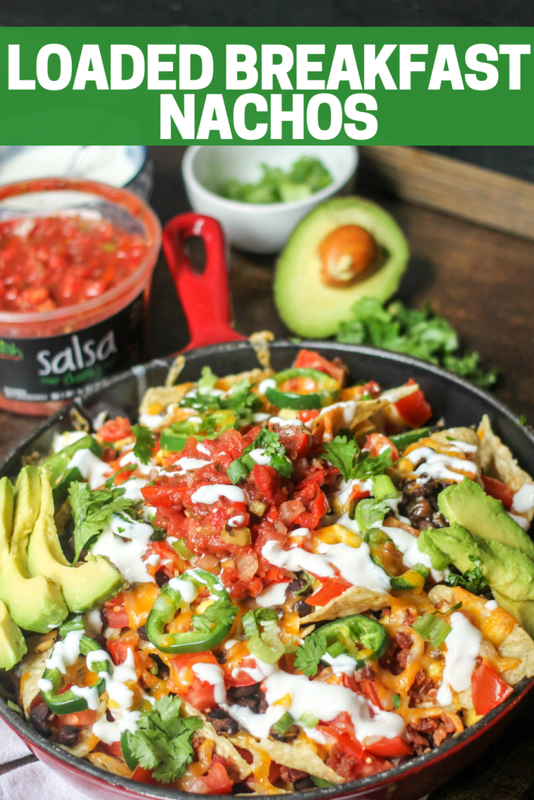 I love using Fresh Cravings Salsa on these loaded breakfast nachos because they use high-quality, locally sourced ingredients, and never cook the salsa (like jared competitors) so the taste stays fresh and chunky! I am obsessed with their Chunky and Restaurant styles, but they have tons of other options as well. Fresh Cravings Salsa is made in small batches, packed with nutrients, free from NINE major allergens (wheat/gluten, dairy, soy, eggs, shellfish, fish, tree nuts, iodine, and peanuts) are cholesterol free, trans-fat free, vegetarian, low carb, and low calorie all while keeping a bright, savory flavor; it’s the best! You can find their products all over the country, and they are totally budget friendly, it’s awesome! Check the store locator to find the closest local grocery store where you can buy them! Bruschetta Baked Brie is loaded with fresh tomatoes and basil on gooey brie; this will be your favorite go-to easy party appetizer! Buffalo Chicken Loaded Waffle fries are loaded with shredded buffalo chicken, bleu cheese, buffalo sauce, more cheese, and ranch make the most epic fries EVER! Garlic Hummus has only a handful of ingredients! Save money and know exactly what’s in your food with this easy homemade hummus recipe! Jalapeno Popper Bombs are filled with spicy jalapeños, cream cheese, pepper jack cheese, and then baked to golden perfection. They’re the perfect appetizer! Jalapeno Ranch Loaded Nachos are loaded with fresh ingredients and homemade spicy jalapeno ranch. In less than 20 minutes you have the perfect dish! Million Layer Dip is filled with tons of fresh vegetables and Mexican inspired flavors. Everyone will go crazy for it at your next fiesta! 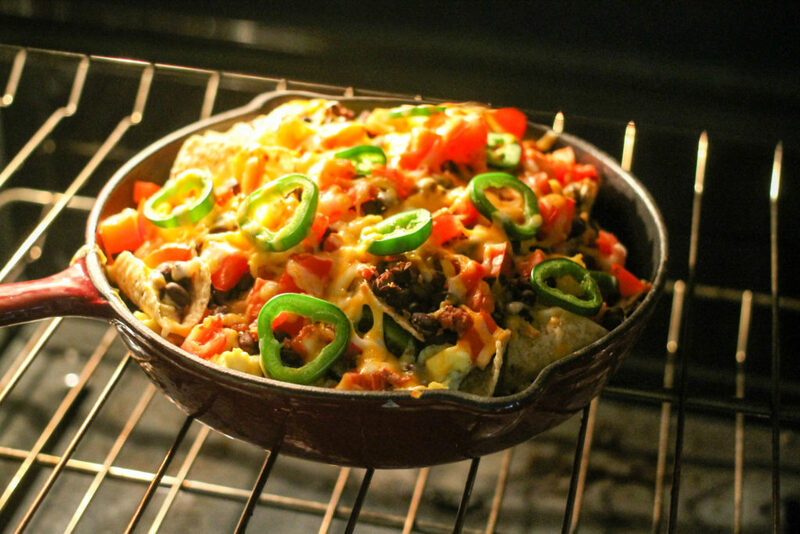 Preheat oven to 350 degrees F. Using a baking sheet or skillet, add tortilla chips and layer with scrambled eggs, beans, bacon, cheese, tomatoes, and jalapeños. Place into oven and cook for 10-12 minutes, or until cheese is melted. Carefully remove from oven. In a small bowl mix sour cream and milk (this will thin it out a bit, optional). Top nachos with Fresh Cravings Salsa, sour cream, avocado, and cilantro. Enjoy! Feel free to add or remove ingredients as desired. 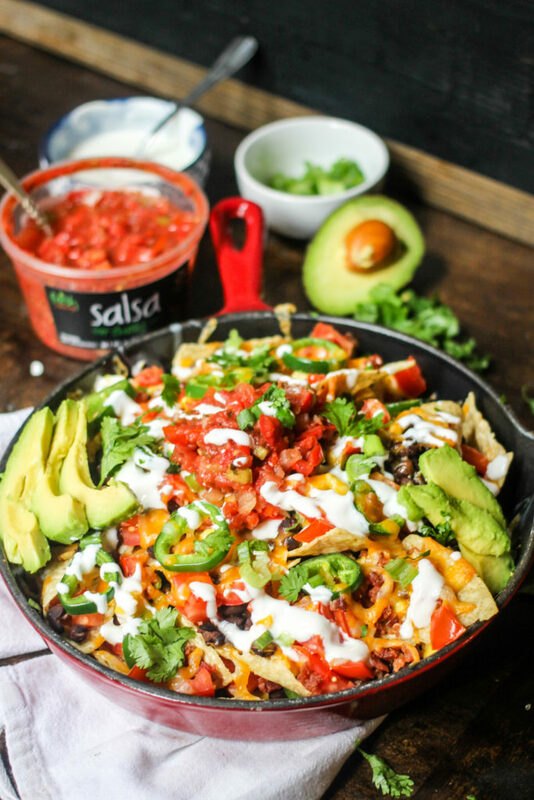 These breakfast nachos have unlimited options of additional ingredients that would be delicious! Sooo good, this is my kind of breakfast! Nachos for breakfast? Sign me up! Sounds incredibly delicious! I love how festive and tasty this recipe is, just perfect! I love all these veggies and flavors for breakfast! Yummy! I know what I’ll eat for breakfast today. Your recipe is perfect for me. I want to try it immediately. I really like this recipe. It really impresses! An interesting mix of ingredients. Thank you! You do realize that this is the best idea for breakfast ever, right???? I thought so too, LOL! Nachos for breakfast! This is a must make! They look amazing! Nachos for breakfast… yes please! These are perfect for Sunday brunch! YES! Makes the perfect brunch! I just have to say that this is the way to start a new day!! Looks amazing!